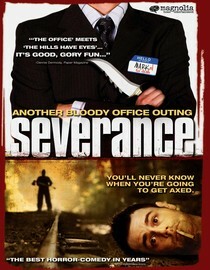 I can honestly say that Severance (click here to add to your queue) is one of the better horror movies I've seen in quite a while. The story centers around a group of employees from a weapons company who head to a luxury cabin on a "team-building" exercise and end up being stalked by a bad dude. I really liked this movie because while most horror movies nowadays focus on being gorier than the competition this one slows down and focuses on having good actors, a story that has time to build, and a bit of dark humor thrown in for good measure. Don't get me wrong, this is still a horror/slasher type movie where people die a violent death. Just this time you care a bit about them, have a few laughs and wonder what is going to happen next. If you like horror movies I recommend giving this one a look. I found it highly entertaining. Why is it in your queue? Horror movies make me all warm and fuzzy inside. Best thing about the movie? Maggie. What mood should I be in to watch this movie? Looking for laughs and scares. So many of these movies were in my queue already, or I've wanted to see forever. I'm so excited about this one! I can't wait to watch it! Definitely give it a look it was really enjoyable!